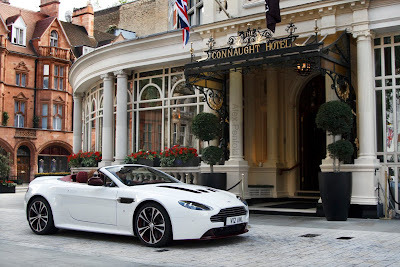 Marchettino - The ONLY official website: V12 Vantage Roadster spotted! Roof down and V12 roar, that's how awesome is the new Aston Martin V12 Vantage Roadster. The roofless version of the track-focused Aston had its public debut last weekend during the Goodwood Festival of Speed. Just 101 customers will be able to own one, ofcourse after they've written a cheque of 187.000€. Under the hood we find a huge 6.0L V12 that produces 517hp and 570nm. Spotters Munch997 and Alex Penfold have been lucky enough to spot the very 1st one in the streets of London!